Fish make for great pets. But, you need to take care of the environment you provide to them for them to stay healthy and kicking. This is when filters come into play. Buying filters separately can be costly and a bit irritating as well. Therefore, your best bet is to go for an aquarium that comes with a built-in filter as it saves you money and also the hassle of installing it. 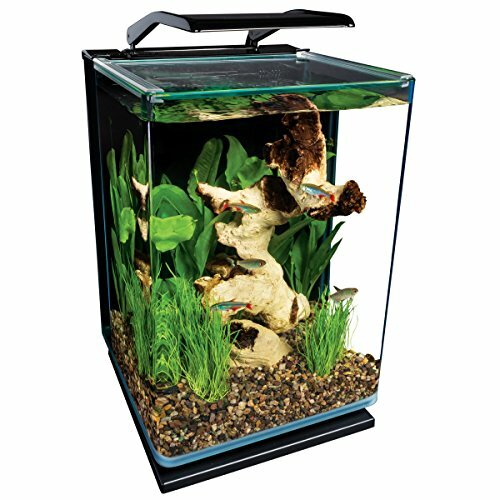 We have chosen 5 cool aquariums with built in filtration that are best of their kind and also easy to maintain. If you’re looking for aquariums with built in filters then Marineland is the manufacturer to turn to. Marineland LM 90609 is a popular choice among fish lovers due to its great design and other kickass features. Its portrait design makes it look unique and due to its perfect size it can easily fit into confined spaces. It can hold 5 gallons of water, which is enough for a variety of fish including betta fish. The glass of the aquarium is the best thing about it as it is rounded at the edges, giving it a perfect look. It’s also quite sturdy and easy to move. LED lighting is another feature of the product. It offers 2 way operation mode, that is, daylight and night mode lighting. That’s not all, this aquarium has a complete filtration system at the back that works on 3 way with a Rite-Size Z Cartridge that cleans up the waste left by the inhabitants and keeps the fish tank clean at all times, providing a healthier environment for the fish. The package also comes with a marine bio-foam that makes the filter system even more effective. However, the base of the tank is made from plastic and can sustain damage if hit hard. Attractive design with curved edges. 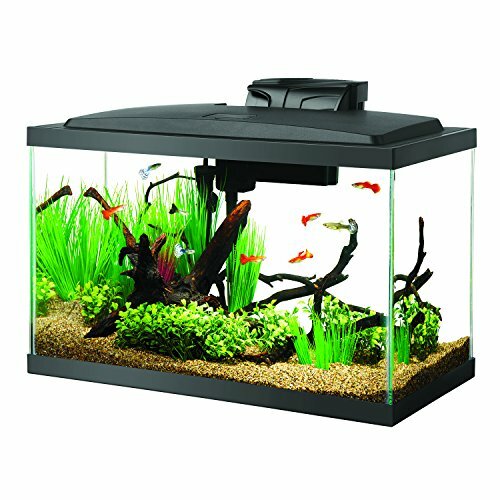 In the world of 5 gallon aquariums with built in filtrations system, Fluval Spec V aquarium is the choice for most fish lovers. The incredibly durable, functional and elegant etched glass design of the aquarium is a combination that you don’t find in many aquariums. The built in Spec-V lighting feature is amazing and let’s you see the tank’s inhabitants even when it's dark as it is composed of 37 LED’s. The thing that keeps the lighting feature of this system apart from other systems is its size. The Spec-V light is almost the same size as the tank and covers the entire tank so that you don’t have to adjust it every now and then. The filtration system of the aquarium is commendable as it works in a 3-way manner, cleaning the tank contents physically, chemically and biologically. The bio-foam in the system blocks the larger waste particles while the carbon layer filter stops the smaller ones. However, it doesn’t come with a heater, which can be troublesome for some people. 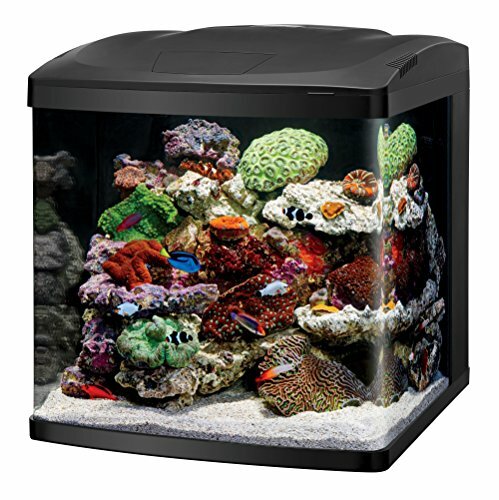 If size is an issue and you’re looking for a big aquarium, then Aqueon aquarium fish tank is the perfect choice as it has a volume of 10 gallons with a hood on the top to provide illumination. An ideal setup for setting up a tropical fish tank. This is one of the best aquariums with built in filter systems that also has an LED indicator system that warns you when you need to replace the cartridges so that the filtration system can work perfectly and provide maximum results. 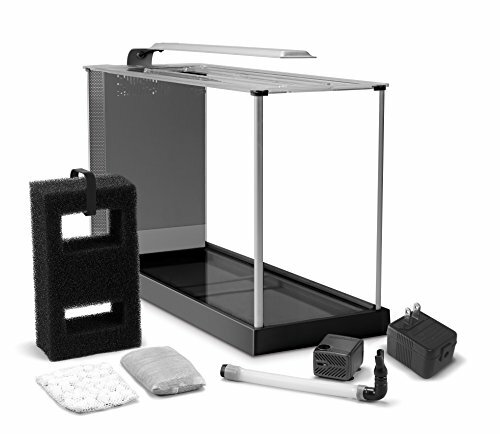 That’s not all, the system also comes with a 50-w heater, fishnet, water conditioner and a thermometer to keep your tank at a constant temperature of 78 degrees which is suitable for most of the tropical fishes. The filter system works like a charm and makes sure that all the impurities are taken out of the tank. 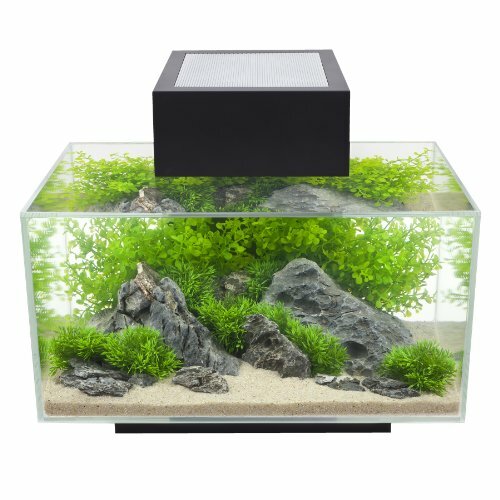 Overall, this aquarium kit is amazing as it comes with all the qualities that you need in an aquarium. However, on the downside some users report of the LED lights having a very short life as they are exposed to water and typically stop working after a few months. ​Complete package for beginners (also comes with a guide). The Fluval Edge aquarium is the perfect fit for people looking for looks plus functionality because it serves both. This 6 gallon aquarium has a high-end built-in filtration system which is not only silent but also keeps the water crystal clean and maintains a healthier environment for the aquaria. The unique 3D cube design is the center of attraction and creates a focal point wherever it is placed at. The aquarium also comes with there are 21 LED light bulbs that make it easy to feed the fish even when it’s dark out there. The entire tank is placed on a pedestal and all the filter wires and connectors are concealed inside the pedestal so that it looks neat. The three way filtration system flushes out all the dirt and fish waste out of the tank. The only flaw in this aquarium is that the opening at the top is very small and it can be a bit difficult to feed the fish. 360 degree viewing and visually stunning. Small feeding hole at the top. Coralife fish tank comes in two sizes: 16 and 32 gallons each with 3 different chambers. This is one of the best aquariums with built-in filtration system as it offers the ultimate aqualife experience. You can place both, saline and marine creatures because size is not an issue here. It may be pricey and a lot heavier (53.1 pounds) but the fact that it comes with everything fish lovers desire for makes it a lot more alluring than other options out there. It comes with a remote control that can be used to control the LED lights. The filter also does the job well, without any sort of a noise. It is no doubt that this beauty is one of the best options, but not everyone can afford it. ​Canopy design at the top gives it the perfect look. The top can be easily removed for cleaning purpose or adding accessories. These were some of the best aquariums with built in filtration systems that eliminate the need to buy a filter separately. Do not make the mistake of keeping your aquarium without a filter as it does not only spoil the look, but also put the fish at risk. Your best bet is to pick one option from our list.